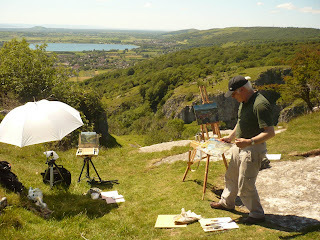 Yesterday I went painting in the Cheddar Gorge with the Plein Air Society group. Well, I say "group" but since Andrew and I couldn't find anybody, it was actually just the two of us (so a group of two then). The heat didn't stop us from walking right to the top of the Cliff - I was putting on a brave face (a bright red face that is) but wasn't that far from fainting! This spot was slightly off the path and offering a wonderful view across Cheddar and beyond. For some reason, I couldn't get the Jurassic park tune out of my head while painting this (probably because of the real sense of drama in the place). I actually had to stop myself from painting dinosaurs in there. What caught my eye was the lovely curvy path with patches of light disappearing into the dark woods. A theme and composition I have done many times now and always gives me great satisfaction. 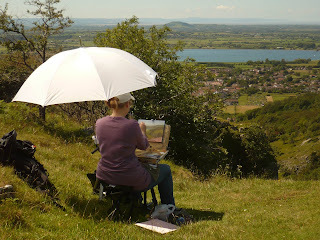 One of my favorite things about your blog is the way you include the photographs of your painting trip. Isn't it great to have friends to share it with? I love all the greens in these, do you use greens or a limited number of colors and mix them yourself? Lovely work. I like the reflection of sky on the lake and the general sense of light works very well in both, adding strength to the compositions. 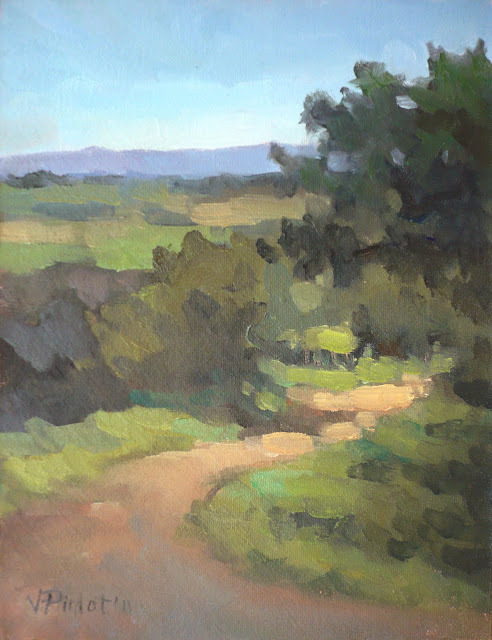 .... you almost understate the sense of heat-stroke we both experienced at the top of the climb; your face went a warm mixed shade of rose madder, burnt sienna and a touch of flake white. A magnificent view and enjoyable hours of painting though once we’d got there. 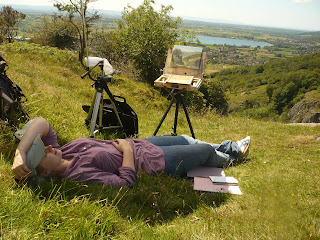 Sorry I could not be there - up a mountain in N Wales with my paintbox (a nice idea but no good in a gale!). Once again that freshness and life in paint, despite the conditions you faced. Hope the tripod is still holding up OK. Thanks Douglas. Glad you enjoy the photographs. For greens I use mainly a mix of ultramarine blue and dark naples yellow and burnt amber. I then have some other green colours I use in very small quantity for some highlights or variety here and there. Thanks Andrew, I agree it was terribly hot and specially for you who didn't have an umbrella! Don't know how you did it. 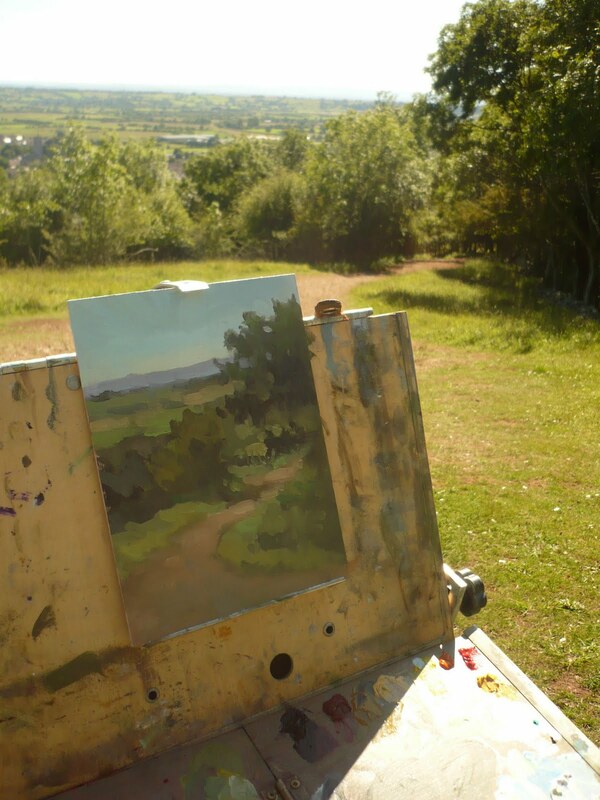 Thanks David, Glad you appreciate the brushstrokes and the light. This is spot on because I always try to have the focal point as the brightest/thickest/most defined area and try to leave the rest looser. I have just found your blog by chance. Glad I have because your painting style I love. Also your photos are brilliant. It`s great to see other Artist`s at work. I`m a follower of yours now. All the best Valerie. 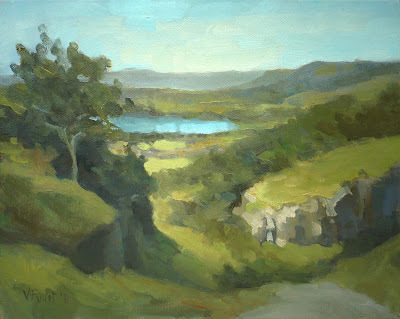 Hi Valerie,I'm an artist from Luton and I've just discovered your blog...love the photos and your style of painting.